Reading birth stories in a wonderful way to prepare for your baby’s arrivals. Labor can be easier when you understand what you are getting yourself into! Positive birth stories can inspire you to have a better birth experience and realize that it IS possible to have a beautiful childbirth. This is the second story in our Birth Stories Blog Series to be featured here at Birth Eat Love. This story comes from mom of 2, Suzzie Vehrs. She writes at More Giggling Moments. This is such an inspiring birth story! If you are a Mom who may have a had previous difficult birth, and are hoping for a better experience this time around, this is a must read story. 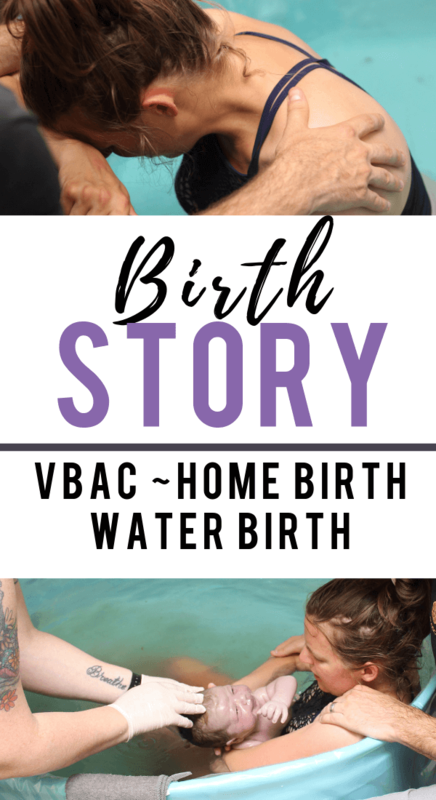 Want a water birth? Considering a vbac at home? This story will really encourage you as to what is possible! Suzzie was so kind to include pictures of her beautiful birth too! I had so much fun birthing my daughter Hazel. It was an incredibly powerful experience. One that will stay with me my whole life. I almost didn’t want to write it down because it is impossible to capture with words the feelings and experiences that were her birth. It was the most powerful experience of my life. Intense, intimate, sacred, emotional, painful, not painful, full of union as myself, Hazel, Zac (my husband) and my birth team all worked together. I’ve never felt so supported in my entire life. I had had many dreams of Hazel’s birth during pregnancy. I’d often spend some time in the evenings talking with her, sharing a favorite memory of the day, something I thought she would enjoy on earth and preparing her for what birth would be like. I think having her in my mind and heart daily helped us form a special relationship. By the time I was in labor, I knew my child. I already knew the feeling of her being next to me and could see her in my mind. It was a great comfort when things felt challenging and I wasn’t sure if I could do it. It was a surprise when I first held her that she looked exactly like I had dreamed, with dark hair and dark eyes. My first birth was a very difficult experience physically and emotionally. One that broke my spirit and left me with a lot of recovery work to do. My water broke, there was a cascade of interventions, a clock I was laboring against and very little support ending in a c section. From the beginning of this second pregnancy, I knew I had to create a different experience or else I might not survive, physically or emotionally. As soon as I found out I was pregnant this time, I found both a midwife and a doula who would support me in a home birth. I had no desire to go near the uncertainties of a hospital in such a vulnerable and important time again. Because of my midwife’s advice, I also rented a birth tub so that I could labor and birth in the water. I was SO glad I did this. My mom came to help me a couple days after my due date, but I still had not had the baby. When she only had 2 more days before returning home, and I was 40 + 6, I decided to have my membranes stripped. It didn’t seem like anything happened. The next morning I sent my mom across the city to go spend some time at her temple and my husband left for a full day of work. I had a doctors appointment to go to at 9. Around 7 AM I started to feel some mild cramping, by 8 I was timing contractions and by 8:30 I called my midwife to tell her that I was having contractions about 5 min apart and no way could I drive. They were much to intense and needed my focus. Baby was coming today! By 9 I was slightly panicked, as I had planned on having a long early labor to set up the house, and I had sent my birth team off for the morning. Contractions were already demanding my attention and I never had time to do the prep things for the birth I was saving for early labor. I made a quick call to my doula who said she’d be there in a couple hours and rang a friend to come help me until the troops arrived. From here things progressed rather quickly for a while. 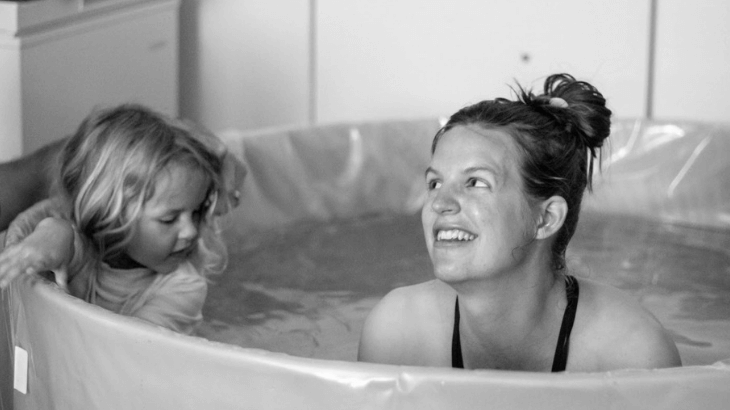 My doula arrived, the birth tub was delivered and set up, I got in the warm water and it felt so good. Zac, my husband, cancelled the rest of his appointments and came home for the day. I was mostly enjoying being in labor at this point. Talking, laughing between contractions and very much enjoying actually getting to labor unlike the first time. Soon my midwife, Brandy, came. I said I had to poop and everyone got really excited, as if the baby was almost there. Did I need to poop or was I getting ready to push? Turns out, I did have to poop, and was not having the baby yet. I was about 7 cm though. When my mom got back, she brought my daughter in for a visit. Zoe hoped in the tub with me and we blew bubbles in the water and listened to the song “I’m coming out” from the Trolls soundtrack. I was about 7 cm in this picture. But then labor stalled. Hazel had been posterior most of pregnancy, only turning the right way with lots of coaxing and bodywork on my end and always flipping right back if I laid down. When I got out of the tub to use the bathroom and after they checked me, she turned back to being posterior. At this point, I started to have back labor and things got more uncomfortable. The best help through these contractions was to be on all fours and have my husband literally sit on my low back. I could push against him and get tons of counter pressure and relief. Back labor wasn’t too bad when we were doing this. However, my midwife wanted to try to spin the baby into a better position for birth. It was not fun doing the miles circuit and other positioning things at all. This is when I started to feel discouraged and glad I was not in the hospital. If I was, I definitely would have asked for an epidural. Partly because contractions hurt, but also because it was hard to see the progress. The end was not in sight. I kept remembering how I never dilated past a 3 the first time. I started doubting if I could open enough to let a baby through. At some point, labor slowed enough that I was able to take a nap for about 30 minutes and recoup some of my energy. After a while with no success in turning the baby, my midwife examined me and we decided we would birth Hazel posterior and stop trying to re-position her. I went for a walk with my husband (putting my hands behind my head like a runner while doing this gave a lot of relief as well). When I returned, Brandy broke my waters and it got really intense. I immediately entered transition. This was so painful, but couldn’t have lasted more than a few minutes. Honestly, I can’t really judge time at this point, it was as if I exited my body I was so far in labor land. I remember groaning, making weird noises and my midwife and doula helping me direct my energy down. Just holding eye contact with my husband during the crazy transition contractions was so powerful. His steadiness helped me remember I was safe, even though I felt scared and out of control. I think I entered the pushing phase in just 3 contractions. This was my favorite part of labor. It was dark outside, we had only dim lights in the bedroom, Ed Sheeran was playing quietly in the background. It was quiet and peaceful as everyone stood by to support me but mainly just watched me do my thing. It was incredible how my body pushed. It was as if the contractions guided me, if I pushed with just the right amount of pressure and direction it nearly entirely counter acted the pain of the contraction. My midwife would remind me to take my break after contractions if I forgot and I’d lean back in the birth tub and rest my head on Zac’s hands. As he stroked my hair, I felt so supported, loved and excited. Sometimes I would notice my midwife listening to the babies heartbeat, but mostly I was in labor land thinking only of my daughter and how she was coming now. At one point Brandy told me to reach inside myself and feel baby. This moment was surreal as I literally felt how close she was to being here. I pushed for about an hour. It was hard work, but not painful, not even when she crowned. She came out sideways with her hand above her head and was 10 pounds 2 ounces. Brandy told me that when she reached down to support Hazel as she was emerging, Hazel grabbed onto her finger. Next thing I knew Brandy guided Hazel through the water straight to my arms. “Pat her back,” she whispered and Hazel took her first breath in my arms while staring up at me. After a few minutes, I moved back into the bed to deliver the placenta and have a stitch put in for a minor tear. All this time I held Hazel and let her nurse. I was in heaven. Every ounce of energy in every cell of my body seemed to have been used as I birthed her, but I felt incredible. Suzzie Vehrs is an author, aromatherapists and birth advocate. She believes that through birth women are called to embody their strongest most capable self. If you want to feel completely empowered in your birth, check out her book Divine Birth. Love birth stories? 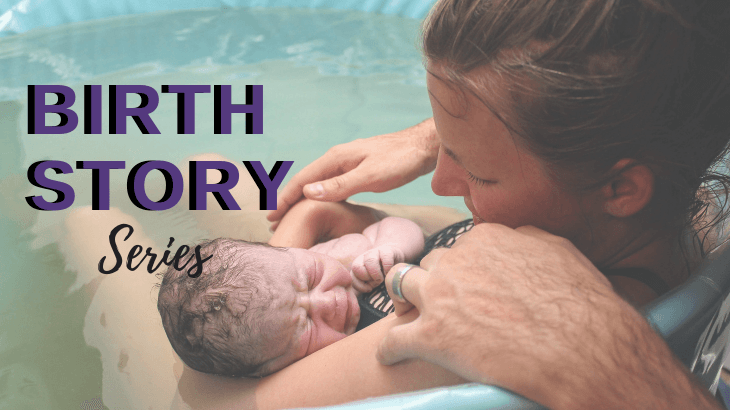 Check out this post with over 30+ positive birth stories, including hospital birth stories, water birth stories and home birth stories. Find our BEST resources for having a healthy pregnancy here! Make sure to grab your free birth affirmation printable by signing up for our email list below! Download your free printable birth affirmations to help keep your mind focused during pregnancy and childbirth. Birth Affirmations are a great tool to help YOU achieve a natural childbirth. Healthy Pregnancy birth, birth story, childbirth preparation, motherhood, natural childbirth. permalink.